The biggest smash hit game of the summer (and subsequently the quickest to fizzle out) was running on the Unity engine. Do you know what we’re talking about? Pokemon GO! Certainly a game that was fun while it lasted. If you’re still playing, more power to you. Maybe you don’t want to build the next hit augmented reality game (or maybe you do–again, more power to you! ), but you’re here because you want to learn some Unity! We’ve put together a list of 8 solid Unity game development tutorials. You can use these guides to hone your skills and master Unity. Begin! The official Unity 3D tutorials, from Unity itself, are divided into two sections. There are tutorials for learning the actual engine, then there are “services and production” tutorials, which teach you some “extra” features we’ll talk about later. The tutorials for learning the engine will walk you through building different games. For beginners, there’s a “Roll-a-ball” tutorial. It’s a nine-part tutorial that does a good job of holding your hand through the process. When you have roll-a-ball down, you can move into the “space shooter” tutorial section, where you’ll build a game revolving around asteroid blasting. We could all use more asteroid blasting. Amidst these game-building tutorials, you’ll find other useful gems. One of the standouts is the procedural cave generation tutorial. It’s a tutorial that…yes, that teaches you how to procedurally generate caves. It’s a 9 part tutorial, and it’s for advanced scripting designers only! Don’t skip the basics and jump to procedural cave generation, you wild animals! If you have questions, you can use the official forums. The different tutorials have their own forums, so it’s not complete and total mayhem over there. Don’t let our 3D focus distract you from the 2D love! If 2D is your thing, you can check out the Unity 2D game creation section, which is chock-full of walkthroughs covering all the relevant elements you need to get cooking. Remember the Services and Production section we talked about? Those tutorials teach you about topics such as Cloud Build, Game Performance Reporting, and give you some general Developer Advice. You also might want to try Unity’s tutorial called “Coding in Unity for the absolute beginner“, it covers everything about coding in C#; it includes the basics of coding, variables, functions & classes and how you can use them. Basically, this tutorial is for someone who wants to learn to code in Unity but doesn’t know where to start. Comparable knowledge and maybe some extra tidbits can be found over on the official Unity YouTube channel and make sure to check their wide range learning resources—it includes different learning styles for developers at all levels. A great quick-start option is the one-month game school. This site offers three courses on making games. The classes were put together by Brandon Wu, who had spent years working at EA and Sony but has since left and started his own game studio. He designed the curriculum of his “Make a Game” course to take just four weeks of work on the side. In short, it’s a tutorial that takes a reasonable amount of time. The catch? The programs were designed with Unity 4. For the most part, they will work with Unity 5, which is currently the latest version but be forewarned that not everything will line up. The second catch? There’s a $25 price tag on the course. You can get free material and $5 off a purchase by signing up for the email list. Still, if you’re strapped for cash, dropping $20 on a tutorial for slightly dated software might not be your cup of tea. If you do take the plunge and start the course and proceed to hate it, you have a 14-day window to get a no-questions-asked refund. The good news, though, is that he’s received nothing but positive reviews from those students that have worked their way through his month-long course. He teaches a combination of Unity and PlayMaker, so you don’t actually have to code through these tutorials. If you have some experience with coding languages, this isn’t the tutorial for you—it will be too basic. The inclusion of PlayMaker eliminates the coding element, so you’ll make your game code-free. He also mentions that his course is kid friendly; he’s had an 8-year-old take it alongside that kid’s parents. So, if you’re young and looking for a way to start, or you’re an adult looking for a program for your child, give this one a closer look. He was once in your shoes, having to teach himself how to develop video games. He is a big proponent of learning by doing, which is what you’ll do with his tutorials: Dive right in. If you need an introduction to the C# language, Catlike Coding could be your ticket. It takes you through the basics, each tutorial building on the one prior. Eventually, you’ll have a solid foundational knowledge of C#, and a good concept of how best to use it in Unity. The tutorials are text-based. Images punctuate the lessons, making it easier to follow along, but there are no videos (if that’s your thing, check out one of the other options on this list). Catlike Coding has two game tutorials after you spend some time entrenched in C#, that end with a creation which in the right light, you could call a “small game”. One’s a pipe racing game, and the other is a maze game that takes advantage of procedural rendering. Aside from asking for you patronage via his patreon account, the Catlike Coding tutorials for C# coding in Unity are free to use. If you can handle text and image walkthroughs, want to learn C# and don’t want to pay a dime, then give Catlike Coding a look. Right now it’s 80% off, meaning you can grab the course for just $19. It has a 4.4 star average across 176 reviews, meaning it’s not a bad use of your time. The course contains 17.5 hours of material, spread across 249 lectures. The course revolves around building your own “dream” game (probably not a real dream game if it’s your first foray into game development, but it’s likely closer to the stuff of dreams than you would’ve gotten without the course!). Throughout the course, you’ll learn how to build some games reminiscent of popular games already on the market, think Candy Crush, Balance Ball, and Subway Surfers. You need Unity 5 and a computer that’s able to run Unity 5. Lifetime access is granted to the course for a one-time fee. It’s best for beginners, but if you’re further along and want a game developing refresher, or some incentive to build something for your portfolio, this course could be a good option. If you’re looking for an upper-tier option from Udemy, check out their “Learn to Code By Making Games – The Complete Unity Developer” course. It costs $195, but it has over 15,092 ratings and has an average of 4.6 stars. That’s some premium programming, folks! You’ll learn C#, you’ll learn fundamental game design elements, you’ll be able to transfer your newfound knowledge to other languages, and you’ll learn about object-oriented programming in practice, all while fostering a positive attitude to problem-solving. If that’s not out of your price range, give the course a look. It will be an investment in yourself, and one that you will likely thank yourself for years to come. We have another free one, and it’s on YouTube, no less! This YouTube channel features all kinds of tutorials across different engines and different facets of game design. So, it’s worth browsing when you have an hour some afternoon. After you’ve mastered the beginner and intermediate lessons for Unity 5, come back to this link. This particular link brings you to the first tutorial in their short series about the “hidden features” in Unity 5. It has some great features you might have otherwise missed. This Youtube channel has a tutorial series on how to make a first-person shooter game using Unity, overall it has 8 parts. 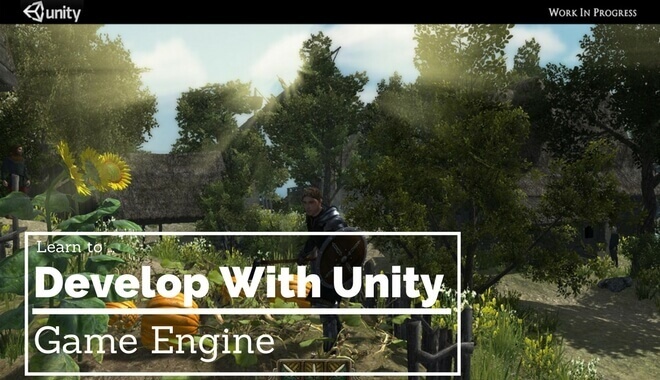 MisterNinjaBoy also has this video tutorial that shows you the basics of Unity game engine and this is a must-watch video for game developers that are new to this engine or are still beginners. MisterNinjaBoy’s latest video of the Unity engine is the “Unity 5 Tutorial : Basics“, the video won’t be talking about the programming side of development but will only show you an overview of the engine to help you be comfortable using it when you start developing your own games. Another Youtube channel, Escape Inertia; he has a series of unity 3d engine tutorials on how to make a game, it only has 2 parts though. However, he also has other interesting Unity engine tutorials like, how to create fire & snow in your game, how to make your unity game look better, and a few other more. Daniel Wood’s Youtube channel is all about coding and computer-based design tutorials and guides. His series of Unity 3d Game development tutorials is 30 in total and 2d game development tutorials is a total of 27—overall he has 57 Unity engine tutorials.